No. Our consultation is completely free with no obligation. Our consultation process may be a bit different from other firms you may have contacted before. Our firm wants to be absolutely sure that we clearly understand each individual case before making any decisions or giving any suggestions in order to give the most help to each veteran that contacts our office. Our consultation process involves working directly with our Veterans Disability Team starting with our Intake Specialist. Once you have called our office or filled out the Consultation Request information located on this page, our Intake Specialist will send you a digital form via email that asks questions about your service and your claims history. Once we have received the responses to that form, we may ask for a few documents such as Rating Decisions, Notices of Disagreement, etc. to get further clarification regarding your particular case. 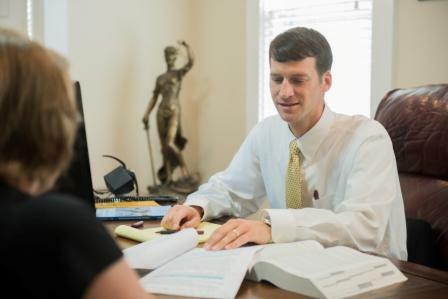 Once our dedicated VA team has gathered all of the necessary information, our VA attorney Travis Studdard reviews that information. If it seems as though we may be able to assist with your case or we need further information that would be better addressed in a phone call, we will then schedule a time for you and our attorney to discuss your case. Unfortunately, because our VA attorney does personally review each case, he is unable to speak directly with each veteran that contacts us. Some consultations may take longer than others based on the complexity of the case, but our team will keep you updated throughout the duration of the consultation. Do I have to come into your office to have a free consultation? No. The consultation with one of our Veterans Disability Team Members can be done without a face-to-face meeting since we work with veterans all over the country! We are happy to meet with you in person if you would like to schedule a time to come to our office to discuss your claim, but please be aware that we make our decision based on multiple factors that cannot be covered in an office visit. How Much Will It Cost If I Decide To Hire You As My Attorney? If our team believes that we can be of assistance with your case, there will still be no cost you unless we recover money for you. This is because we handle veterans benefits cases on a contingency fee contract. This is different than attorneys that work by the hour or require that you pay money up front, known as a retainer. A contingency fee means you only pay us for the work that we do on your case if we get something for you. If we do not recover money for you, then our work on your case is free as well. It is not going to cost you any money up front to hire us. If you decide to hire us, we will go over the contract with you and answer any questions that you have about this. Are There Any Costs Other Than Attorney’s Fees? The only small costs that might be incurred are the costs associated with your case. This cost is not for the work we do on your case. It is for the charges by other companies to get the information we need to pursue your case. These charges might include getting copies of medical records, hiring experts, or other things. We will sometimes go ahead and pay these costs for you while your case is going. Generally, these costs are paid back to us when you receive your back due benefits. However, you are technically still responsible for the costs even if we do not win your case. A free consultation with one of our Veterans Disability Team Members is easy to set up. There are two ways to do it. Click here and complete the form to request a free consultation. That will send us an email and one of our Veterans Disability Team Members will get in touch with you within one business day. Call us at (770) 691-1689 and press 2. This will take you straight to our VA team’s line. We will get some basic information over the phone to get the process started. As you can see, we try to make our consultation process as straightforward and helpful as possible. There is no obligation on your part in requesting a consultation. Instead, we offer free consultations as a way for you to get the information to decide if we can help you. We look forward to hearing from you.